Did you know that in the 1920's and 1930's, more than 30 films came out of Britain which depicted Mormons as evil vampiric perverts? There´s one of my looks which I´m really proud of: the last one (which I hadn´t had the chance to post any pics of it yet). Here´s some photos. 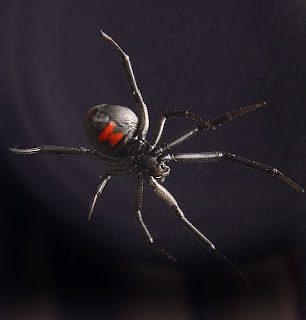 As you can see, I literally re-shaped the figure to make the model look like a black widow and the clothes ARE NOT heavy! Intriguing, isn´t it? The blog is american, I have to say (that distinction IS crucial as the scene and social contexts are completely different on this side of the Atlantic). I´ve not been updating this blog for a while. I´m still trying to sort out my myspace. It´s a mess. Everytime I try to fix it, I move something out of place. Agggggggggghgh! In my opinion there´s no other make-up that complements a breath-taking dramatic look such goth: smokey eyes. Apparently easy to use, it´s harder to apply in a succesful way than what it might seem. Usual problems are the "panda" effect, stains around the eyes AND most important of all, if it´s not applied properly, it might enfasize or create dark bags under your eyes making you look tired, hangovered or like a yonkee! Because of its dramatic effect, smokey eyes should be applied with precaution during day-light, specially in pale skins where the dramatism is even more pronounced. Some people love it on someone else´s eyes, however, other people might find it a bit too gothic for them.....(I´ve had that problem and my skin is not even pale is olive), so again, the key is to be cautious. A very good alternative is to combine the harsh black with a softer grey or to substitute black for a charcoal grey which can still create the same dramatic effect but the contrast will not be that pronounced. I´ve found a video that explains how to do the black&grey smokey eye and I think the look is quite impressive. What happens when dressing head-to-toe Goth during daylight..
"Fashion took a turn for the macabre at Prada, Fendi and Gareth Pugh this season [winter 07], with black and more black. There was also a gothic twist at Alexander McQueen and Christopher Kane, who named witches as the inspiration for their collections. I'm a bit worried about this one, especially when the make-up artist slathers an entire compact of black eyeshadow on me and says she's going to make my hair look 'dirty'. Camilla Staerk's tulle dress is beautifully made, though; the halterneck is elegant and the Victorian bustle skirt makes me feel like a baddie in one of Dickens' novels. The fingerless gloves are rather Karl Lagerfeld-esque and the Jimmy Choo ankle boots are to die for. I suspect the jagged metal cone heels could be classed as lethal weapons. So, individually, I really like each piece of clothing. But head-to-toe, I'm scared by what I see in the mirror. Unlike the other looks I've tried today, it feels unnatural to smile in this outfit. People stare and some swerve out of my way. None grin or stop to chat. Far from feeling empowered and fierce, my confidence is waning - so I move quickly on. "What do you think of my outfit?" I ask two passing girls. "You look like the goths at our school," laughs one. "Yeah, I think the gloves are cool, but there's too much black. You need some colour," says the other. Good idea. We head to a nearby flower stall to take a photo with a bright background. Or at least we try to. The flower seller looks me up and down with a face like a wet weekend and refuses to let me buy anything from him, let alone have my picture taken next to his roses. No wonder goths have a reputation for always being so grumpy - the reaction I'm getting is overwhelmingly negative. Fed up, I head to the nearest cake shop to sweeten up. The girl serving me grins, then makes my day: "Where is your dress from? I love it," she beams. I give her the designer's details and she, in turn, hands over my cake for free. Maybe being a goth for the day isn't quite so bad after all. VERDICT: Not my cup of tea. Head-to-toe black is just too sombre and seemed to scare away everyone. If you're into this look, you've got to be brave and go the whole hog: diluting black garments with bright colours just looks cheap. If you're wearing it in the day-time, go a little lighter on the make-up to avoid scaring small children. 2/10"
MY VERDICT: Goths don´t look grumpy! People think they´re grumpy. 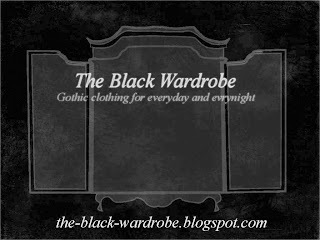 Gothic style is just for Goths or Goth-lovers (people with a strong and very defined personality). This article is a clear example when anyone (not familiar with the subculture) attempts to wear it and then they deeply regret it and on top of that they make a fool of themselves, turning the outfit into a custom outfit. Goth is about sophisticated drama not dressing up for Halloween! Another thing is when you are at work.....or in any other daily-life situation where your attire could get you into trouble or, in the worst cases, into pure discrimination. (Which is illegal BUT it happens). Here is where you have to play the clever game. We already know that ignorants associate gothic fashion with ripped fishnets, badly dyed hair, vampire makeup and any other grungeness in general. 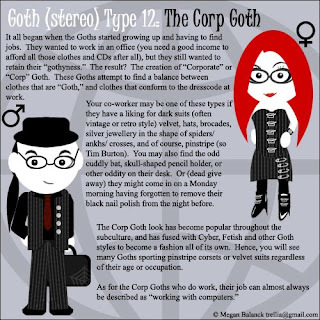 However, although you are dressed in your beautiful and modern fantastic outfit you´re still a "Goth" or a "evil-worshiper" for them. And for them, head to toe Gothic IS still more frightening than fabulous. What NOT TO WEAR to work (all together): pointed shiny shoes (aggresive-sharp lines, and strong sexual connotation), a satin piece (very evening and again, sexual connotation), dramatic make-up (again, sexual connotation-"femme fatalle"). There´s a stunning mix of luxurious textures, sharp lines, combined with a super-shaped feminine siluette (due to a super fit mini)....All that combination of things screams "goth"! Again, choose one thing as the main stand-out piece of your look. What to wear to work: here are two examples of key pieces combined with flat ones in order to minimize the drama of your attire. In the first pic, what it seems to be a heavy-weight brocade skirt is been tamed down with a plain matt shirt and the look it is been finished with a thin piece of jewelry that will not distract the attention to the skirt. In the second pic, a decadent ruffle shirt is been combined with plain black pants, in this case, skinny that gives more volumen to the upper part of the body. In both pictures, the make-up is been kept to the minimal which is a good trick if you skin is extremely pale. Goth may have trendy cultural associations in this millennium, but fashion inspired by the morbid and macabre has been around a lot longer than Hot Topic. And that's what the Museum at FIT is out to illustrate with their "Gothic: Dark Glamour" exhibit starting September 5. More than 75 ensembles will be on display from designers such as Alexander McQueen, John Galliano of Christian Dior, Rick Owens, Gareth Pugh, Anne Demeulemeester, Anna Sui, Olivier Theyskens, Ricardo Tischi of Givenchy, Jun Takahashi of Undercover, and Yohji Yamamoto. "The dark glamour of the gothic has made it perversely attractive to many designers," said Dr. Valerie Steele, director of The Museum at FIT and curator of this exhibition. "John Galliano told me that he saw the 'Gothic girl' as 'edgy and cool, vampy and mysterious,' while Rick Owens said that whenever he saw goth kids, he felt as though they were his children. But other designers, such as Olivier Theyskens and Ann Demeulemeester, reject the gothic label, although they acknowledge that their work may display a certain dark romanticism. 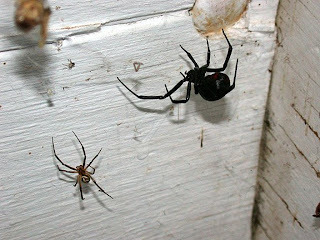 The black widow fascinates me so much. That black skin - adorned by that dramatic deep red mark-is so deeply shinny and silky it screams to be touched like a piece of silk.... 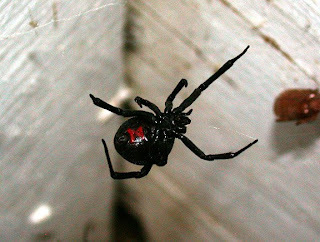 But that´s the trick of the spider, she makes you believe what it is not. On the third picture you can admire how a wimpy male is going to be eaten. 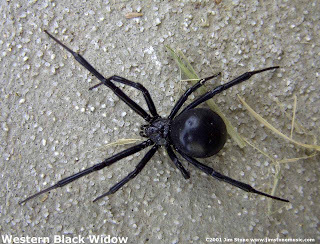 Poor thing...so skinny...but its destiny is been traced by the black widow!